Home box is the home page of the site that users land on when they type the website address on their browsers. All the blue boxes are the categories of the pages on the site. They don’t mean pages only how the pages are categorised. 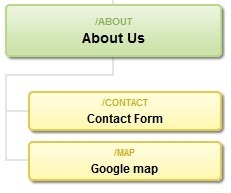 The Green boxes are the separate pages that build up the site. Each of the box represents a single page. Upon finalization of the structure, they will be built into pages on the site.